Concept development and horizontal scrolling website for urban wayfinding system. CityCloo is a new urban marketing system, designed to allow our towns and cities to respond to both movement and economic requirements more directly. The system sees our town centres as a commercial destination, and allows prospective customers to identify and navigate to potential destinations quickly and easily. BrightPie was involved in the development of the CityCloo concept; helping to build the theoretical backbone of the system, as well as offering a guiding hand in the establishment of a brand name for the project. The main task for the team to date has been the creation of a horizontal scrolling website, to simply and efficiently relay the key concepts behind the project. 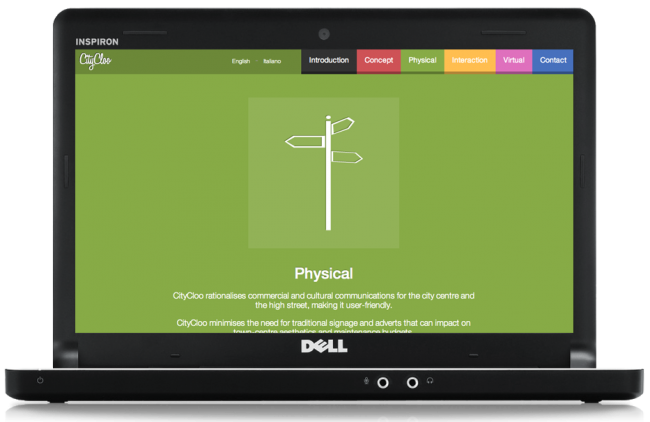 The team hand-coded the CityCloo website, using bold colours in line with elements of the signage system. A series of graphics were also developed to accompany the pages' text, and a jQuery scrolling script was used to facilitate the sliding navigation system. The website was also translated into Italian, in order to cater for international markets. The CityCloo system has been exhibited to a number of public sector clients, and the website developed allows them to easily find information relating to the project, as well as key contact details.